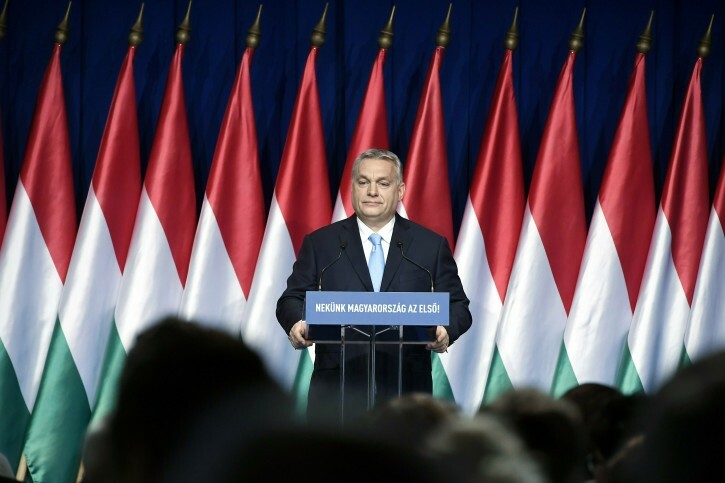 Hungarian Prime Minister Viktor Orban delivers his annual "State of Hungary" speech in Budapest, Hungary, Sunday, Feb. 10, 2019. The inscription reads: "For us Hungary is the first!" Budapest - Hungary’s anti-immigration prime minister says the government is greatly increasing financial aid and subsidies for families with several children. The measures announced Sunday by Prime Minister Viktor Orban during his “state of the nation” speech are meant to encourage women to have more children and to reverse Hungary’s population decline. They include a lifetime income tax exemption for women who give birth to at least four children. Orban repeated his assertion that European Union leaders in Brussels want to fill Europe with migrants from other continents. With European Parliament elections set for May, he said that unchecked immigration would create “mixed populations” in countries that Muslims eventually would dominate and Christians quickly would become a minority. It won’t work . European women dont want large families , not because of the money . It’s a culture and a mentality . You always seem to know what time it is. Time to ban this time to tax that. Now it’s time to move back to St. Mary. You are sooo UNEDUCATED. There is a world famous picture of the Satmar Rebbe ZC"L greeting the King of Rumania in the 1930's . Just another example of your Trumpist fake news. Lets invent something and post it and hope no one knows the truth. The same is true for white Americans. Open the Mexican Border to all Latinos or the muslims will come soon. We already have more Muslims in Congress than Jewish Republicans. Say NO to the Wall and Trump will Fall. Thank Hashem for Nancy. How very old-fashioned, like something from the 1930s. Hungary understands what's needed, now america has to do the same. Countries don’t want a Muslim majority on their own turf but insist Israel create two states.